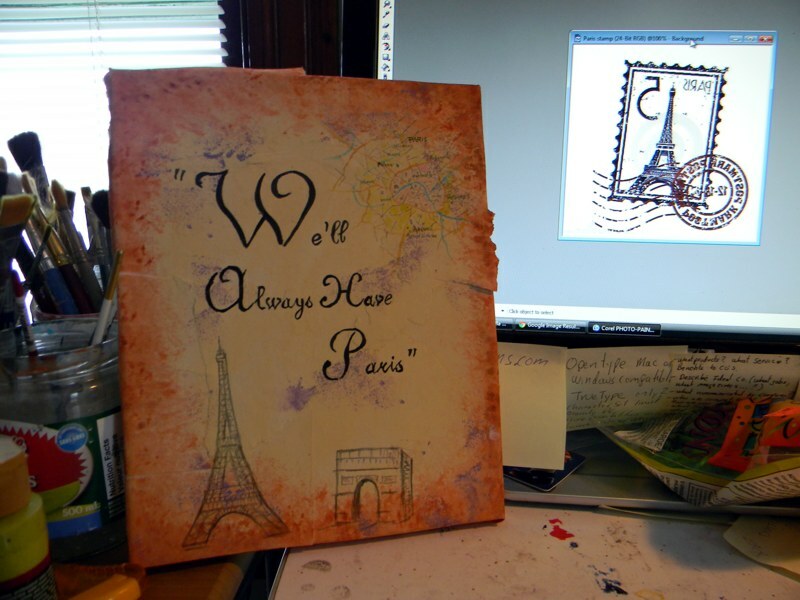 In this last post on the Paris on Canvas project ( which was a birthday gift for my daughter) we will deal with the finishing touches. The picture on the left above is where we left off the last time. The one on the far right is where we are heading. The internet is a great resource for images. Sometimes you have to search a bit but it’s fast compared to visiting the local library and then finding and checking out the book you like. Above left you can see I found a picture of Paris’ Triumphal Gate. 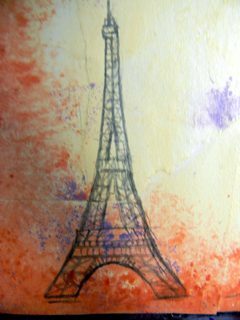 I used a small round brush to paint in a stylized (almost cartoon) drawings of both the Eiffel Tower and the gate. 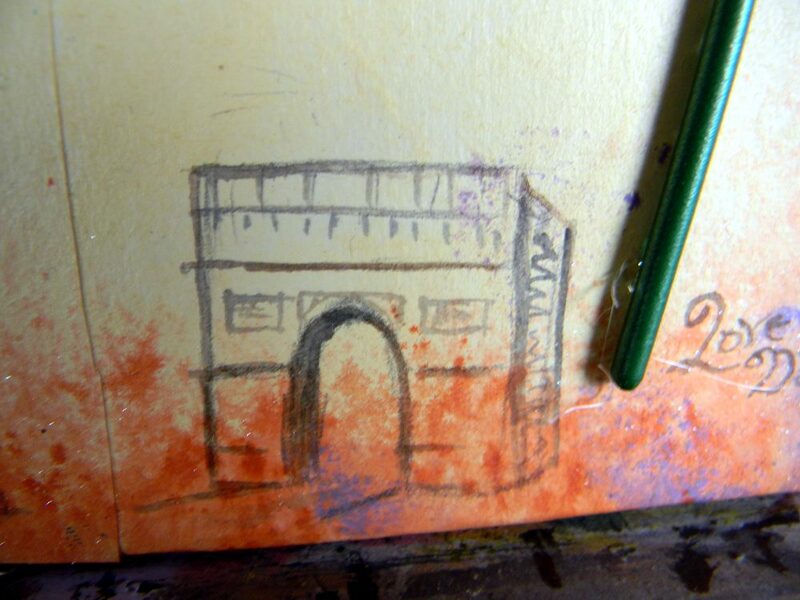 You can use a small 2h pencil to ‘pre-draw’ in lightly the basic shapes before painting over them. I used a watered down black with a hint of burnt umber (brown colour) to paint in the objects. 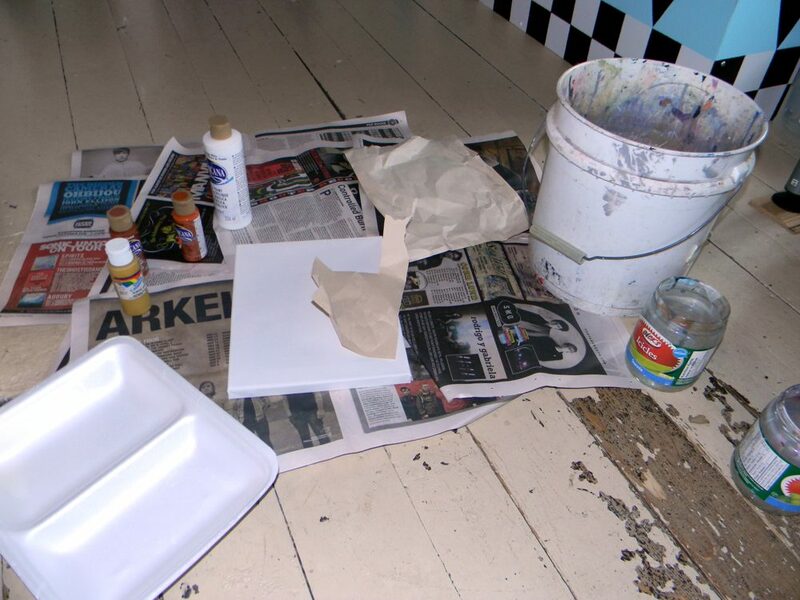 keep the overall impact a bit faded by using thinned paint, not runny, just thin. Notice how the reddish brown ‘blotting’ (sponging) that is the border blends in with the outlined drawings and gives them an aged effect. I do admit that the next step as you can see above is a little difficult in a way. It requires more patience. 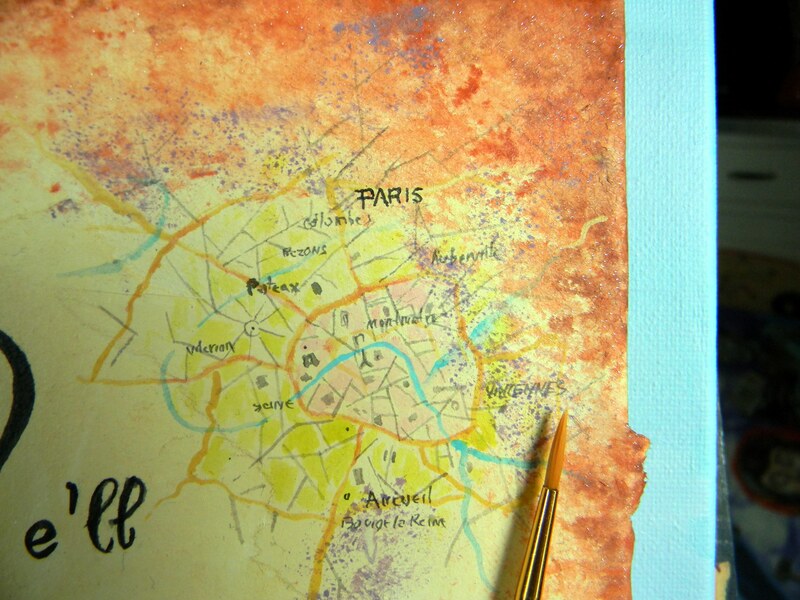 What it is supposed to be is an old version of a map of Paris. I wrote in the map some of the place names just to give it a little authenticity. In fact the writing is so small it’s not really clearly legible. Just “hinted at”, so to speak. Used a small liner brush or small round brush for this. Perhaps you could paint in a small sunflower or something native to France. You can see on the screen I found some luggage postage stamp from the thirties or forties by googling it.In the picture on the monitor you can see that i have it flipped. Originally i was going to trace it on somehow. I ended up just hand painting it as best I could. I was getting short on time to have the gift complete. On the far right above you can see that I experimented with some ‘print’ tools. yes these are rare , hard-to-find items. Just kidding. 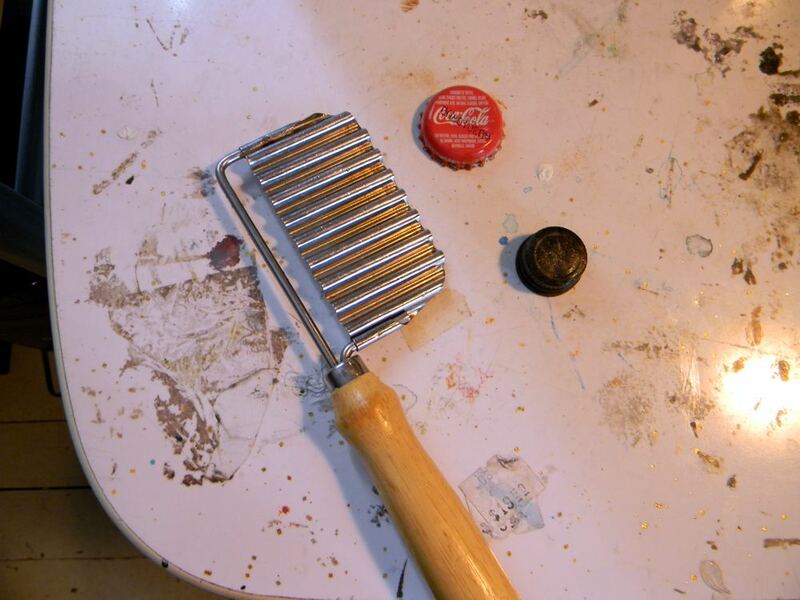 The registered stamp effect was achieved using a Coke bottle cap dipped in the paint and pressed on. The small circle was from other bottle that was kicking around. For the wavy lines i stole my wife’s carrot cutter thingy. perhaps you could find something better. Like the comedian Red Green says “any tool can be the right tool”! ha. 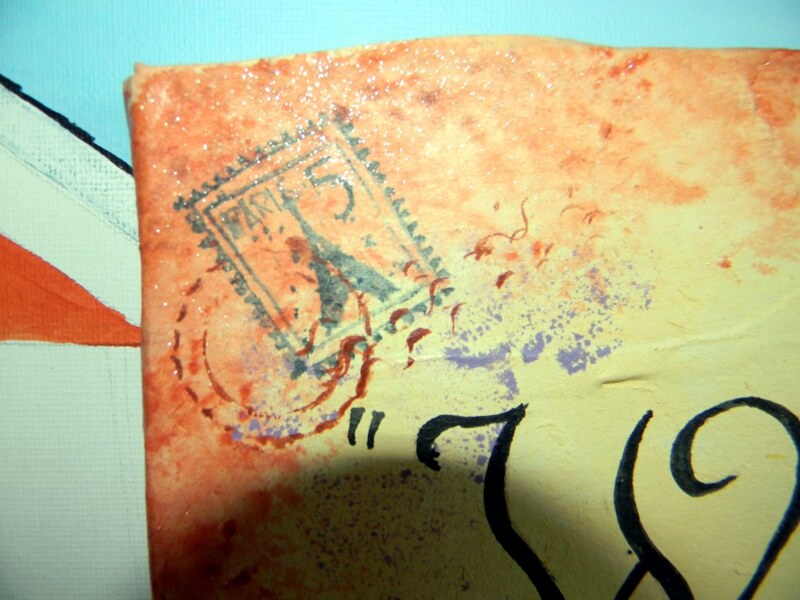 In the close shots of the stamp and the map you may notice some shiny particles around the border. This was some silver glitter spray. Just cover the face of the painting where you don’t want glitter. 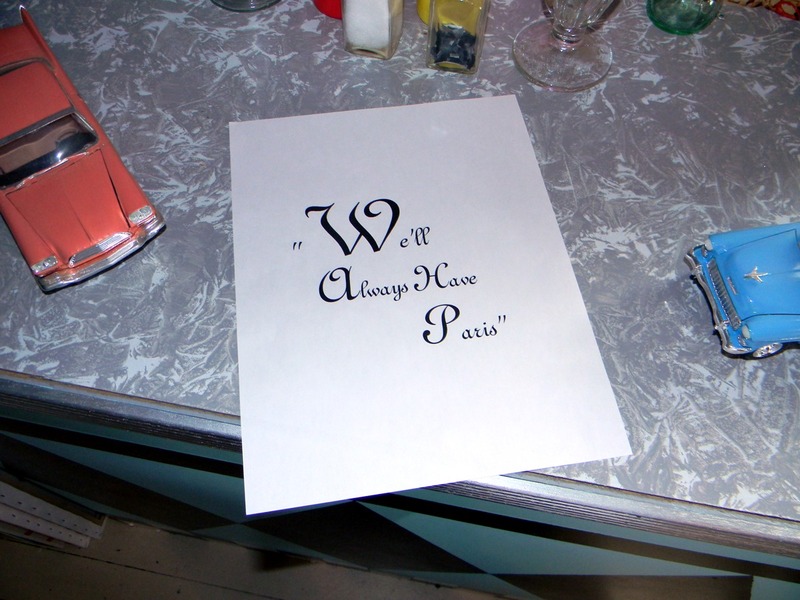 I used the sheet with the “We’ll Always Have Paris” script. Just weigh it down with something so the pressure from the nozzle doesn’t blow the page away! If you want to use some spray gloss on the whole thing and to hold everything in place and then brush on thicker gloss finish if you want. I always use a spray finish first so that if I brush on a coat of gloss finish after the brush hairs will not ‘pick up’ or remove any sparkles etc. Do remember to have a well ventilated area for spraying and do not inhale fumes. 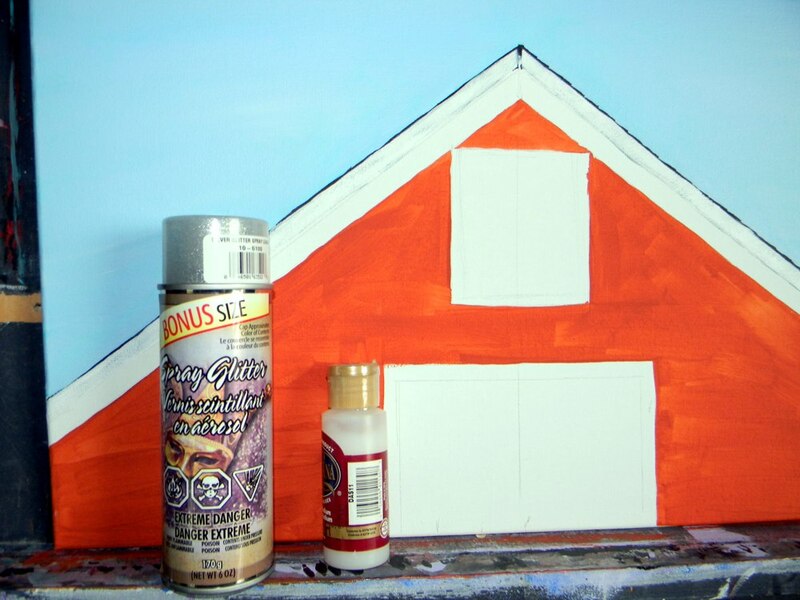 O that’s a painting of a barn roof I started in the background. Might post it sometime. Well that about be it! Just get an inexpensive brush from a value/dollar store and use your hot glue gun to dab it in a couple places and then glue it on. 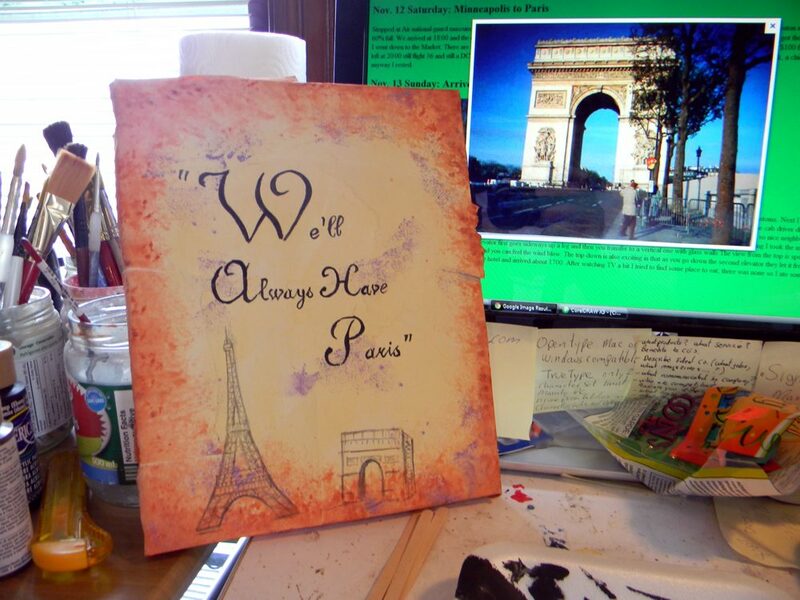 Hope you’ve enjoyed this blog on “We’ll Always Have Paris”. O and my daughter was thrilled with it. Store bought gifts have their place but there’s something really special about hand made ones. See ya next time. Hi. This could very well be the last post on this particular project. I’m going to try and see if these posts can all be transferred to a page to make it more organized. Not sure yet how to do this. By the way, the laminate fifties counter top in the pics is not real. It’s a rag rolling technique I used for a fifty year wedding anniversary set/prop. I’ll tell you about it sometime. Above is a good picture of the text taped on lightly with green low tack tape ( to hold it still). 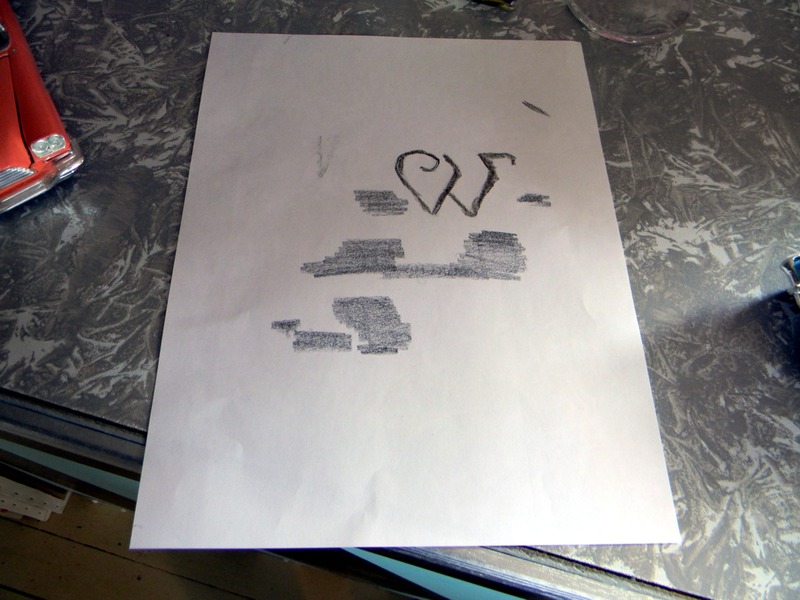 On the right is a not-so-good photo of the results of tracing over the font/words. 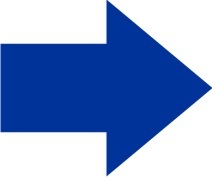 The blue arrow and lines are supposed to help you see the area where the ‘print’ was made. You can use a dull point pencil to trace over the words so as not to tear the paper or damage the canvas below. If you have a better method than please share. At this point I should tell you that some of the edges did have to be glued down i.e. to the sides of the canvas. So I used some white glue for long term strength but tacked them with a medium heat glue gun . The font used here was French 111 BT, I do believe. You’ll notice a little jagged edge of paper contrasted with the lower left corner of the monitor. This was left “popped out’ just for texture and effect. Happy accident. I used a small liner brush (script liner sample) dipped in Lamp black paint. The paint was thinned with water just a teeny bit. The script will not look perfect since you hand painted it. Just take your time. If you make a mistake use some wet paper towel to quickly dab off any mistakes. Think : “Mistakes are good” and you won’t make any. 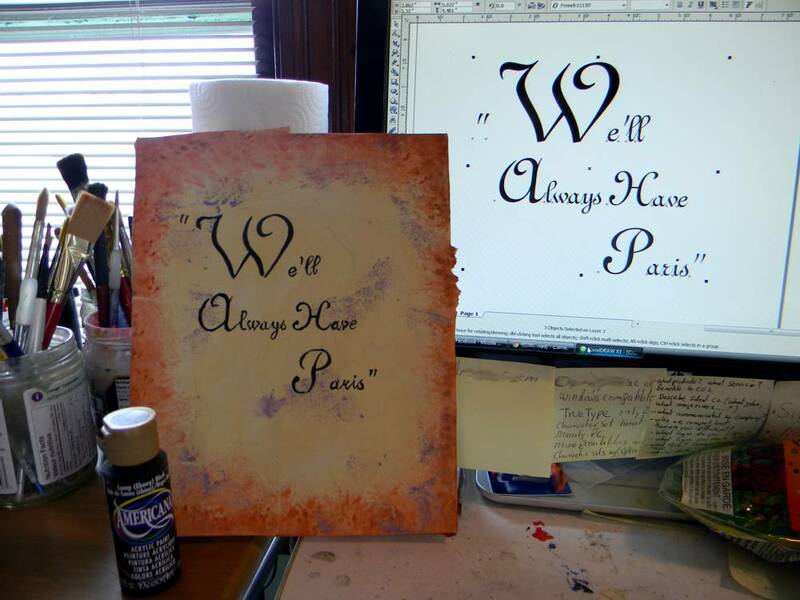 Continuing with the “We’ll Always Have Paris” project you can see the first patch of crumpled wet paper arbitrarily laid on the canvas. This is where artistic licence comes in you can lay this all out however you please. The arrow, of course , is pointing to the rough,deckle edge. 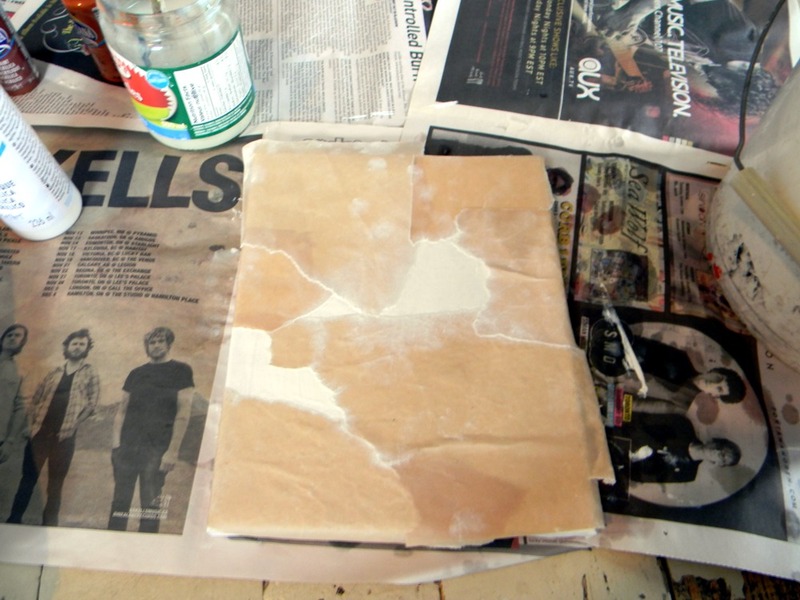 This photo reveals several pieces of paper layered on the wet painted canvas. Overlapping the layers a little is a good idea and creates an interesting texture. 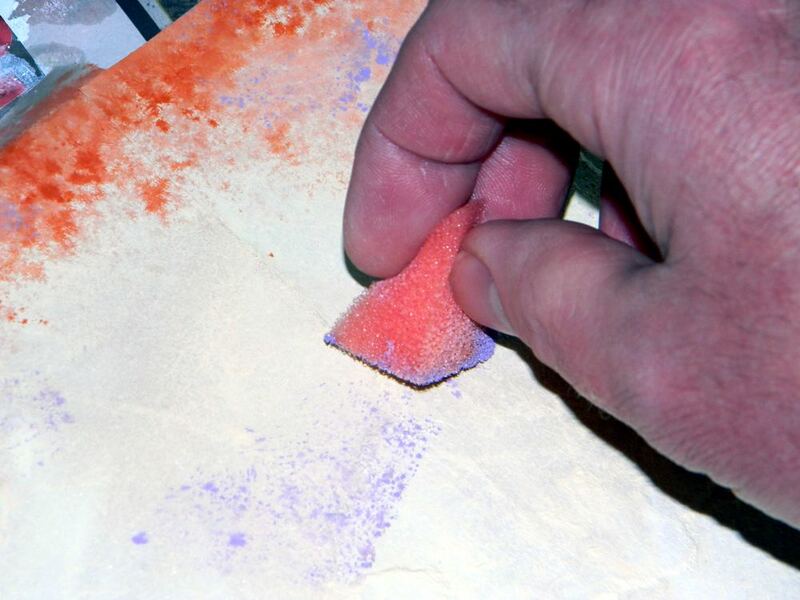 You can also pinch the paper in places to create little ridges however remember you want to keep the center area relatively flat and smooth so that you can write on it later ( see original post). Above left you will see a mixture of white and antique gold. 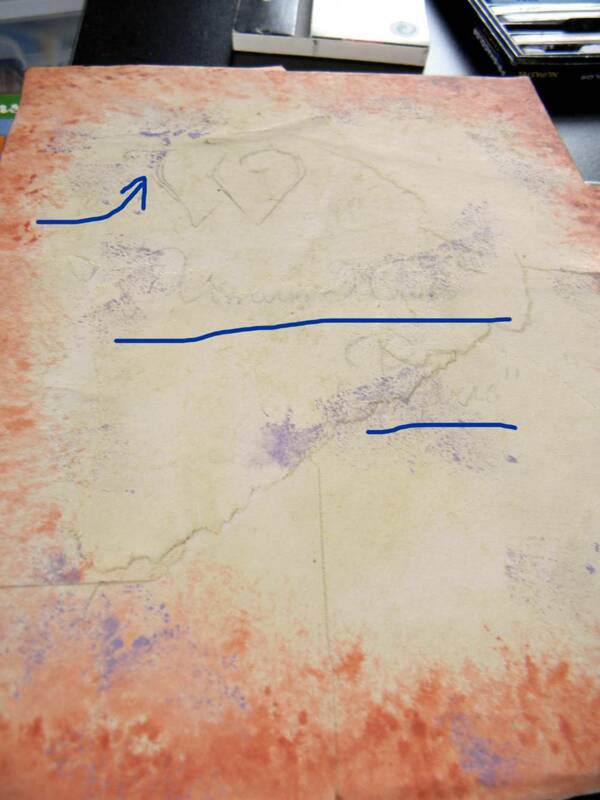 This is the paint I used to cover the strips of paper (above right). If you don’t have antique gold you can try another yellow mixed with a tinge of brown. Be careful with yellows and browns. It’s not a pleasant thought and some may wish to not mention it but you must always be thinking a bit crudely to avoid embarrassment after the project is done. You want earth tones not poop tones. Unfortunately artists must be asking themselves whether or not there are any hidden phallic symbols (they didn’t want) or excrement hues in their art. Tip: Keep a spray bottle with clean water handy. 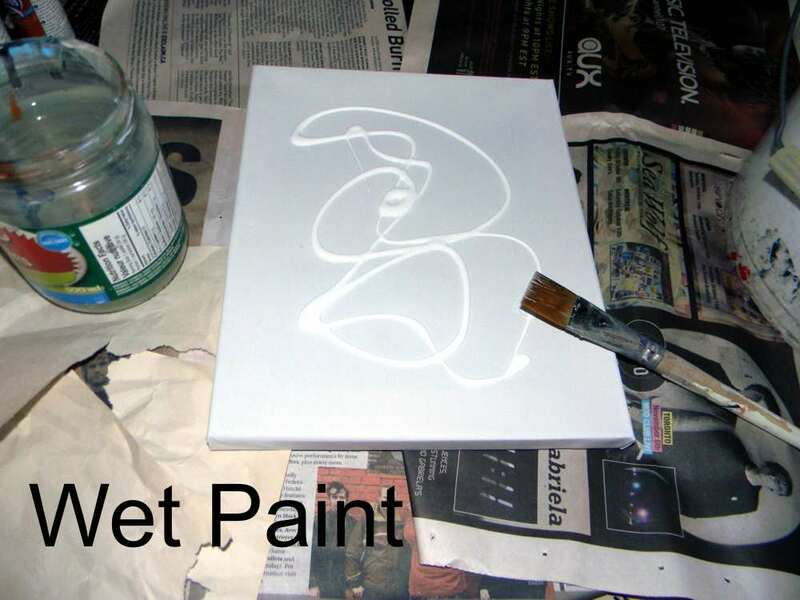 Giving your acrylic paint a fine mist spray of water occasionally will keep it from drying prematurely. You can also use it to keep the project in this case from getting dry too quickly. keep the piece laying flat if you do. 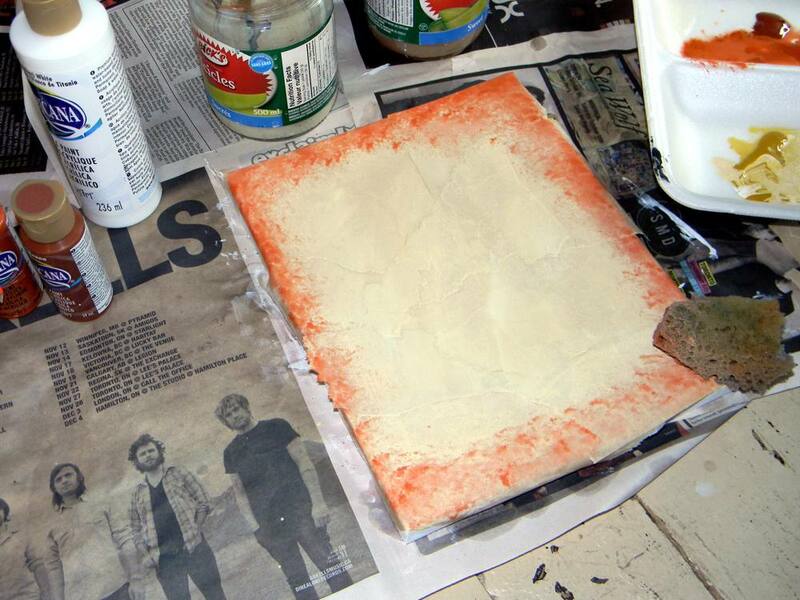 The next thing I did was used a small sponge which was soaked first in water and then squeezed dry. Dip it insome orangy-brown colour ( in this case burnt orange). 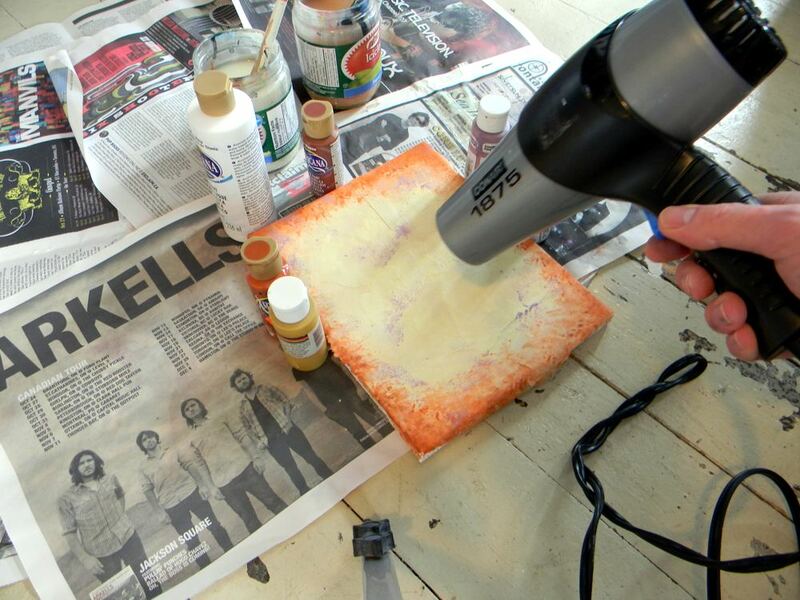 While the surface of the canvas is still damp just dab a little of the colour on around the edge. This will give your work an aged border. Let the colour bleed into the wet tan colour surface. You want it too blend and not seem harsh and contrasting. below are some close-up shots that hopefully will be of help. Soon we’ll be ready for some finishing steps. Below is an example of some added detail that can be placed throughout the face of the painting. Remember to leave space for your writing and don’t over do this colour. You want the violet to just complement the other colours and not over power them. This was done with a finer commercial sponge. 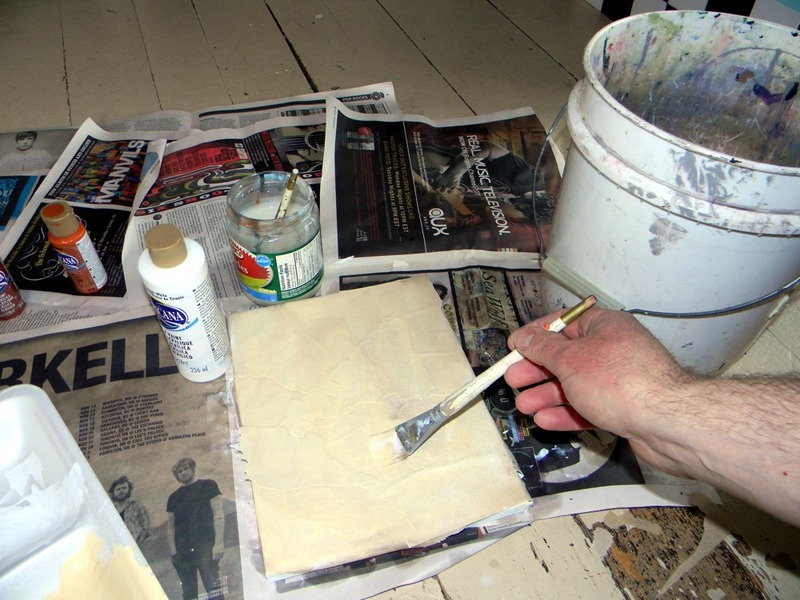 Tip: If you think you placed too much paint on with the sponge then simply roll the sponge over to a clean side and use the clean (and damp) side to sponge off any excess paint. This helps blend as well. Now it’s time to dry the substrate. I’m using a hair dryer to speed things up (below). Remember I was in a hurry to get this done as it was a late coming idea for my daughter’s birthday. You can place it near another heat source like a wood stove or electric heater (but you can’t leave it unattended due to risk of damage or fire!!) To be honest the paper i used was a little heavy and wasn’t sticking to the sides of the canvas as I had hoped so I just propped some paint bottles against the sides to help hold the paper to the corners. 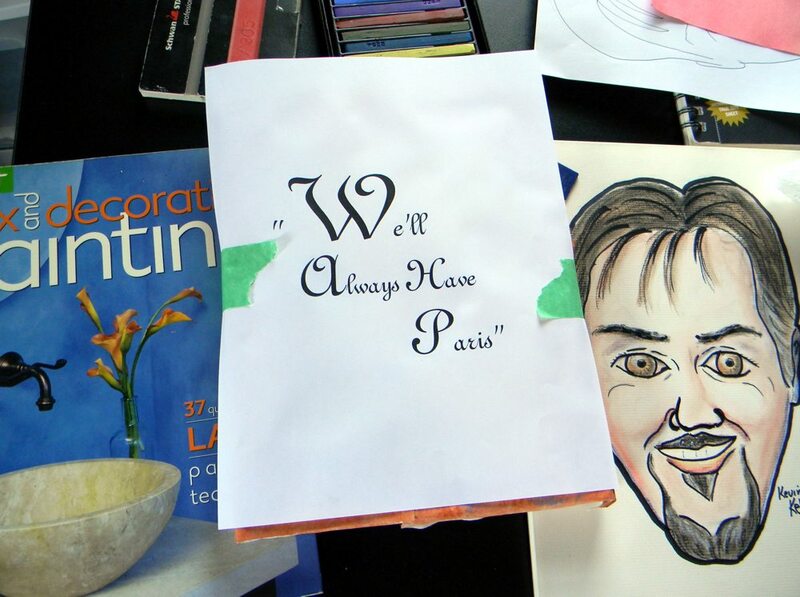 In the previous post I introduced you to my “We’ll Always Have Paris” project/gift. Hopefully this post will give you more insight on how I approached this. As I said the idea came late to me and I had to cut some corners. In the above picture you can see my 11X14 canvas with crumpled beige paper ( I used construction paper this time) You could use any heavier paper. Even blank newsprint might do. The idea is to not use too heavy a paper or the watered down paint may have a difficult time soaking in and adhering to it. Just keep reading. I hope to make it clearer. Next you’ll want to tear the paper in different shapes and sizes. Since you’re tearing the paper you will need a little more paper than what would naturally cover your canvas. In this case 11X14. 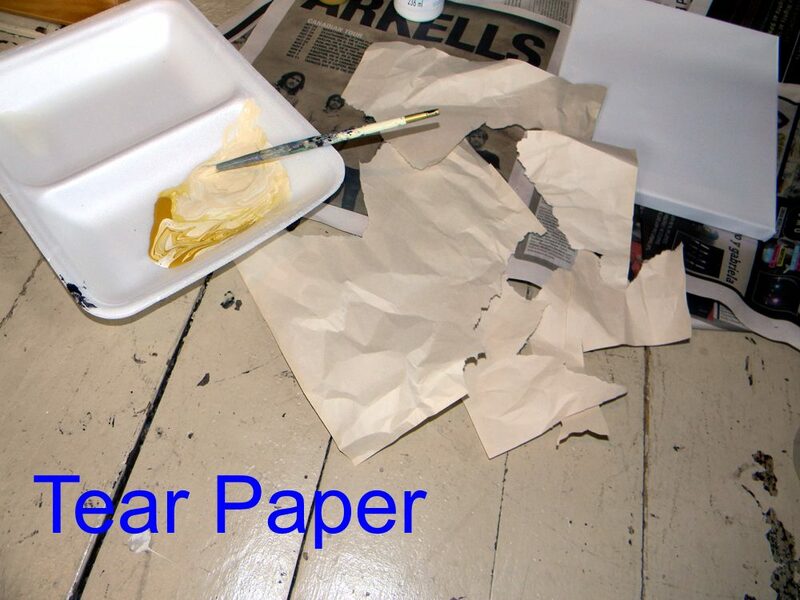 So you’ll will need a bit more paper than a 11X14 sheet. Also tear the paper so there are no straight, factory cut edges. If you do have some straight edges they will have to be folded or wrapped around the edge of the canvas in order to hide them. 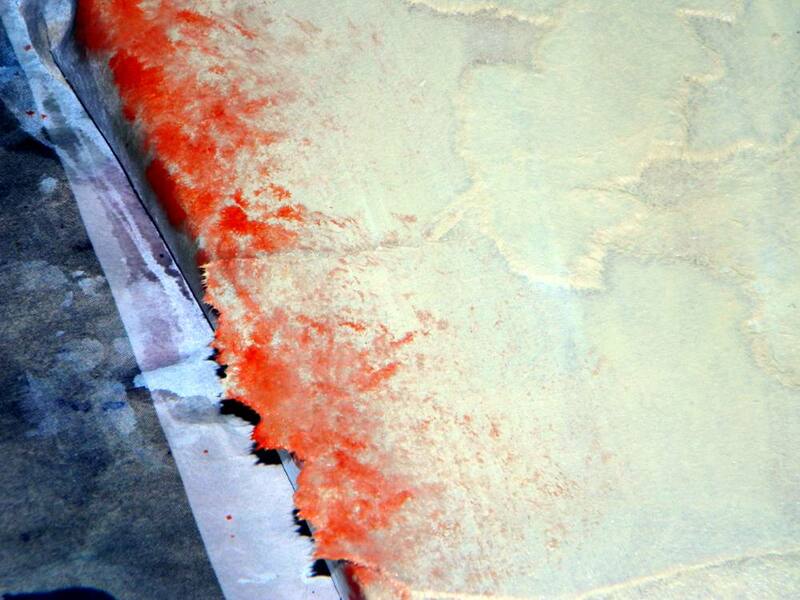 The torn edges will give your work a worn, deckle edge. 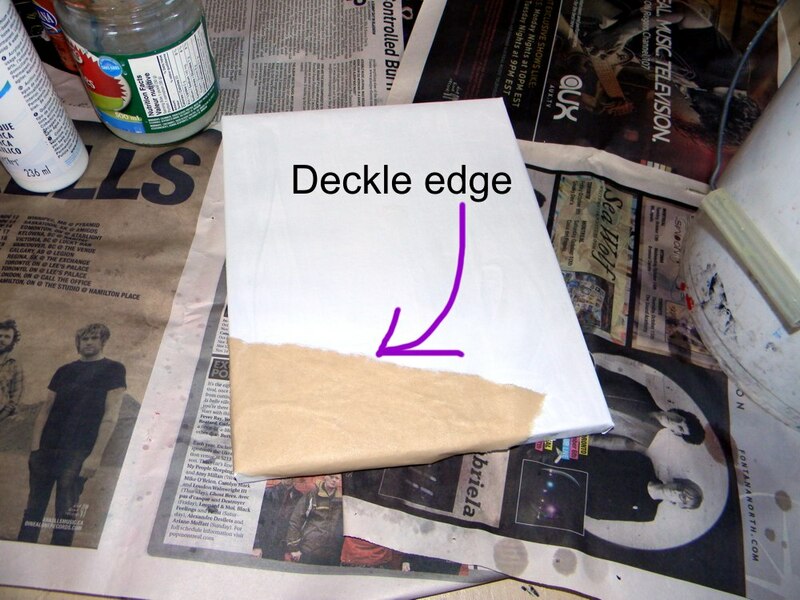 This deckle edge will look very nice overlapping another edge of paper. I’ll explain more on that. 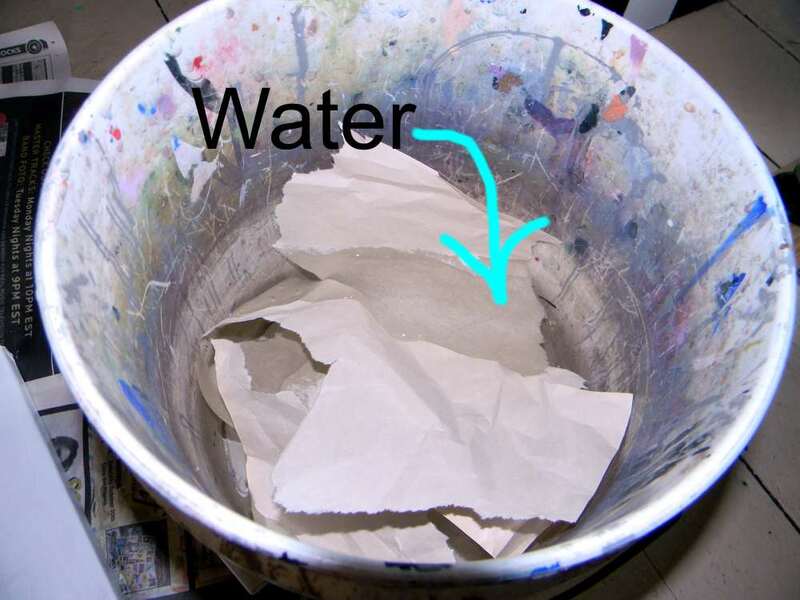 Crumbled or scrunched paper in water. Take your pieces of scrunched paper. You don’t need to make them a complete ball when scrunching. Just a little loose crumpled ball is enough. It’s time to get the paper soaking in the water. 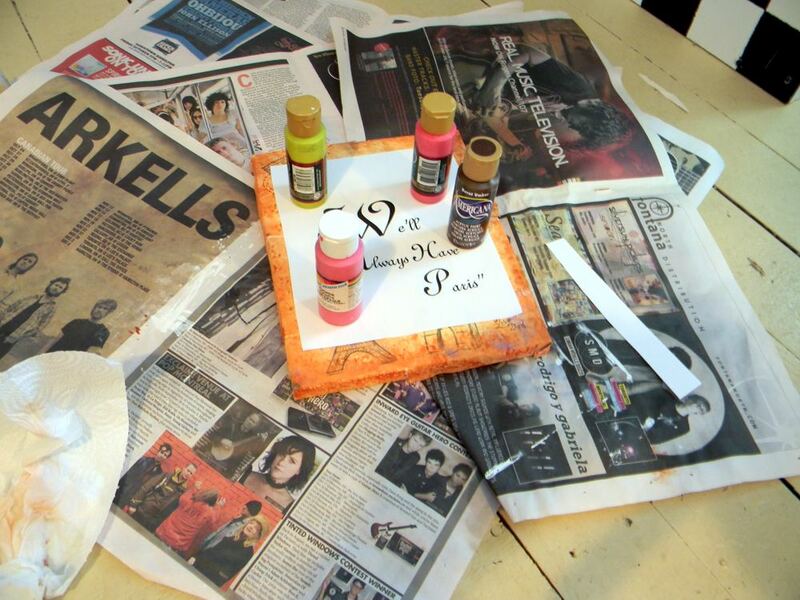 The idea is to have the paper wet and the canvas wet with water based,acrylic paint and the two will stick to each other and then dry glued. A lot of time we tend to forget that paint itself is a pretty good glue or adhesive. In this picture you’ll see that I squeezed white paint right on to the canvas from the paint bottle. You may recall saying I mixed the paint with water just to thin it out a bit..not too much. I did this by having a jar of clean water ready for my brush to dip into. I used a 3 cm or 1 inch flat wash brush (as you see in the photo). You could use a larger 2 inch if you liked. 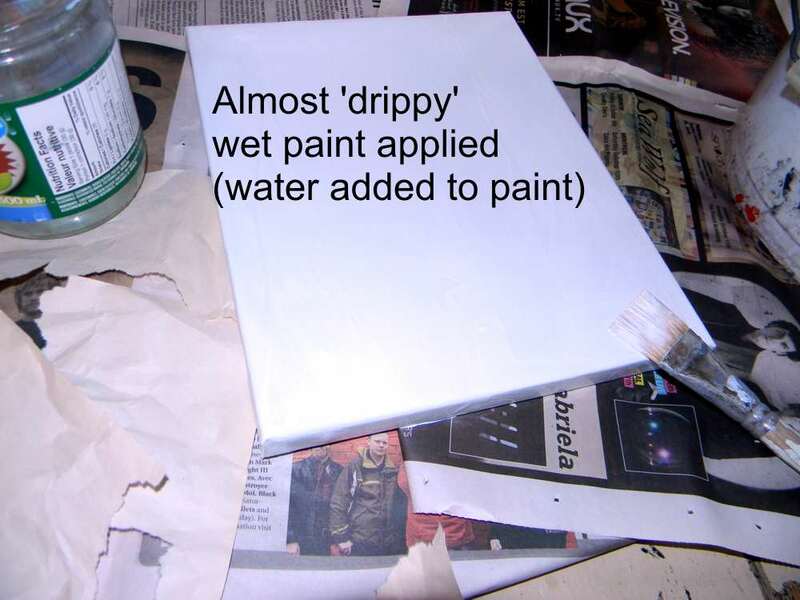 Dip the brush into the water-don’t damp dry it but use it dripping wet to mix in with the paint already on the canvas. 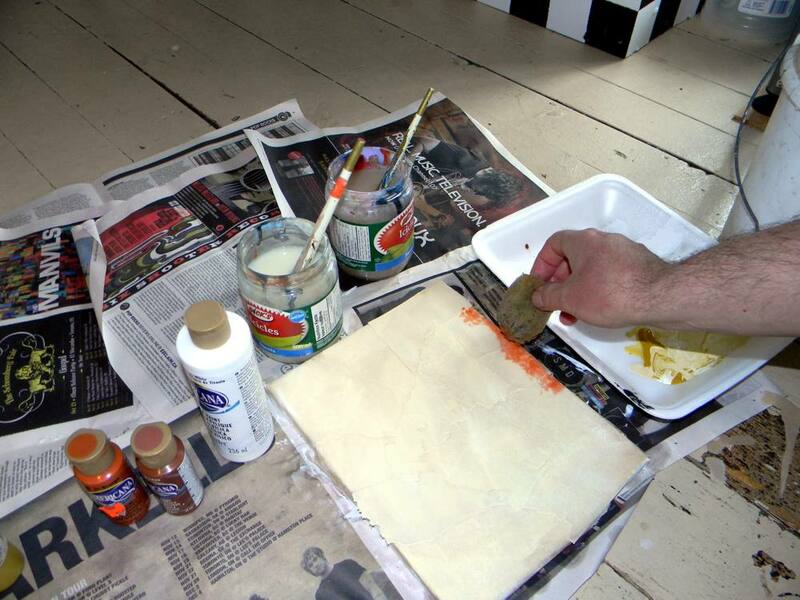 Cover the canvas with this thinned paint including the sides/edges of the canvas. 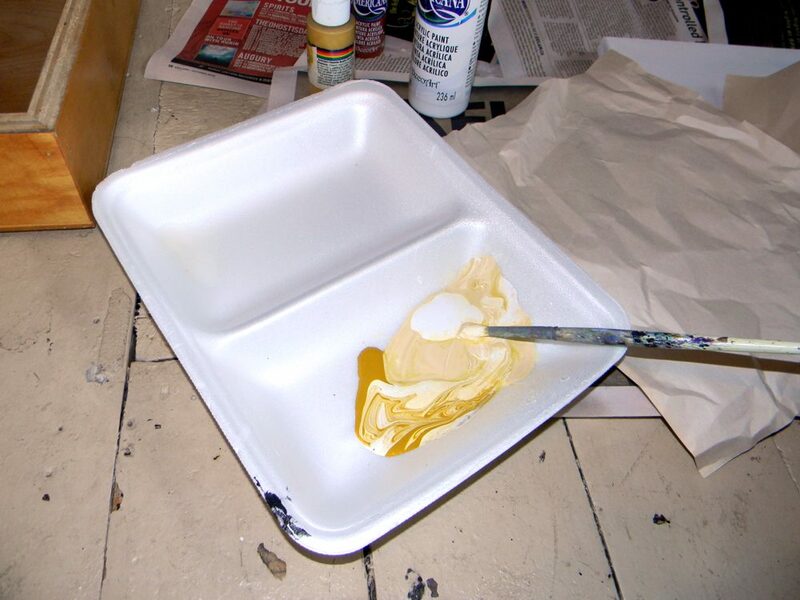 Remember the paint doesn’t have to be too watery just a little thinner so the paint will adhere to the wet paper more thoroughly. If you measured it the water would likely be only a 1 part water to 6-8 parts paint. Here is the painted canvas. It was just a few days away from my daughter’s birthday and I had bought her a beautifully decorated luggage case. It was sort of an art deco piece with 30’s or 40’s luggage stamps, and travel paraphernalia /decoration. 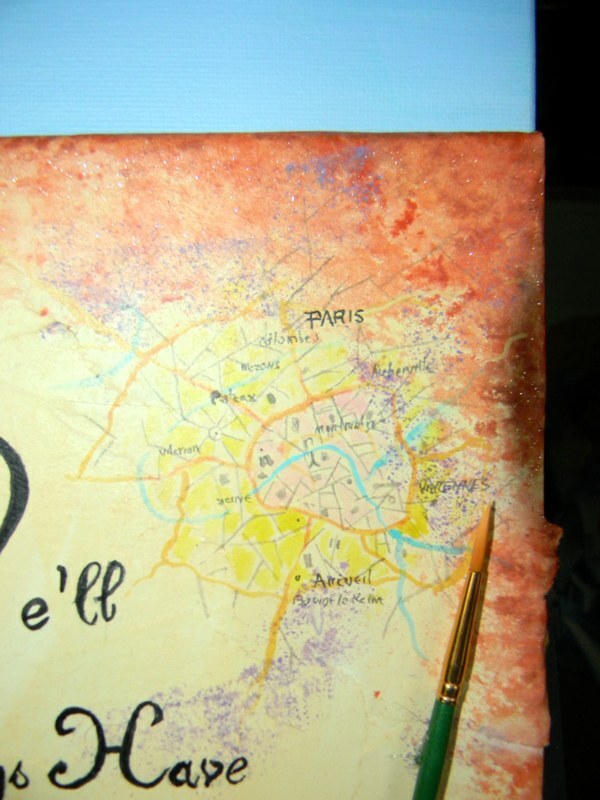 For example it had scenes of Paris ( Eiffel tower,etc) faux decoupaged inside and out. This gave me an idea. What if I could make her a gift that she could hang on her wall? 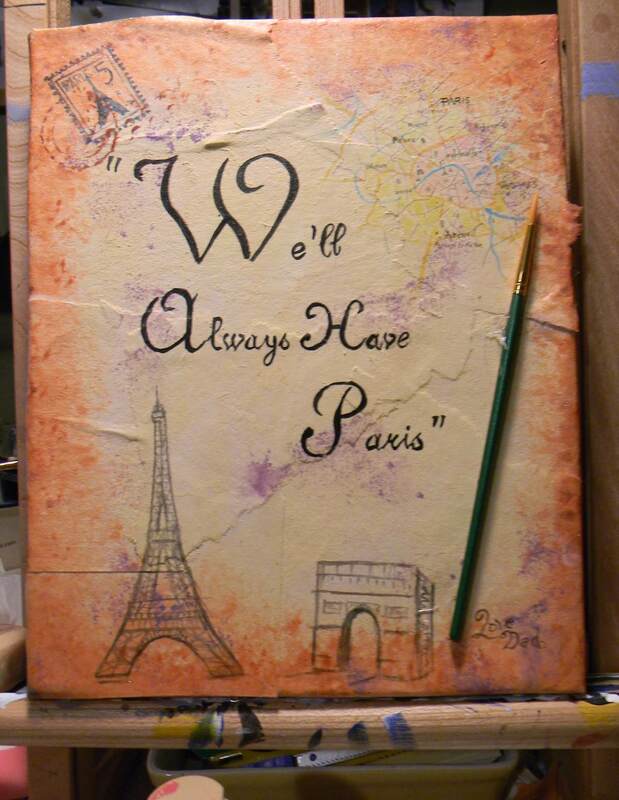 Having watched Casablanca recently and knowing her love for places like London and Paris I came up with the idea of painting the words “We’ll Always have Paris” ( from Casablanca) on to a canvas with a papier colle’ effect. This would give it that Old World feel. To be honest, this effect is usually achieved with paste and glaze. I was in a hurry and only having several hours I decided to stick with paint. Literally. The less I had to deal with then the faster i knew this could be done. 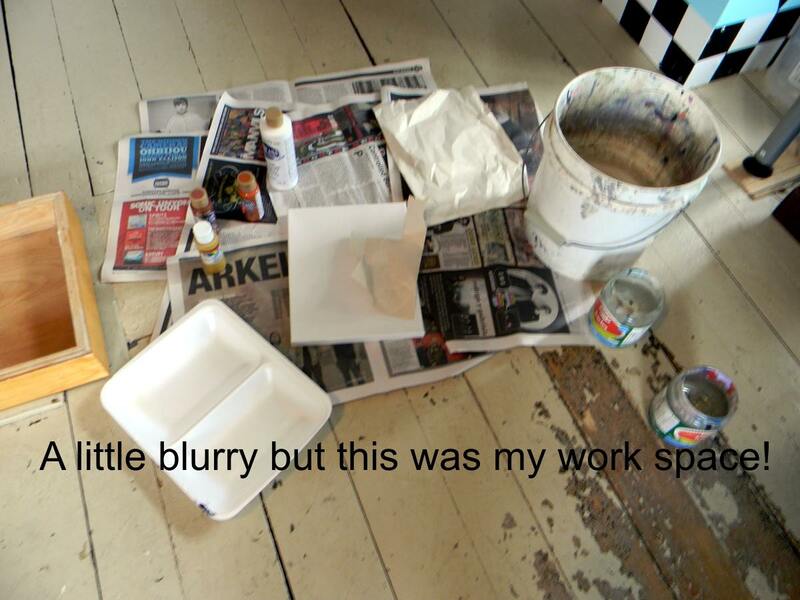 In fact I was in such a hurry that the floor of my art studio became my table since my table was already busy with other projects.